Born of pious parents on 10 November 1861 on the island of Kimolos, Methodia was the third child of eight in her family. She was baptized with the name Irene and from a very young age she stood out by her piety, modesty and love towards the Church. Within the pious environment of her island and a family devoted to Christ, as she matured so did her faith and religious fervency. She longed and waited for the proper time to devote herself completely to God and the Church. Some time after the marriage the husband of the young woman shipwrecked and drowned off the shores of Asia Minor, and then Irene felt that this was the time to fulfill her divine calling. When she confessed her wish to the priest who was her spiritual advisor, he encouraged her to bring her aim to realization. After proper preparation she was tonsured a nun by the then Archbishop Methodios of Siros, and took the name Methodia. This event filled Methodia with infinite joy since her deepest desire was fulfilled. From then on she passed her life following faithfully and with great dedication the rules of monasticism, staying in her solitary cell, at “Stiadi”, in the uninhabited Inner Castle of Kimolos, next to the Sacred Church of the Nativity of the Lord, which is dated to 1592. This solitary cell was a true “confinement” where Methodia led an ascetic life with deep faith and enthusiastic perseverance, and in spite of the fact that she didn’t live in a monastery she kept the monastic rules diligently and religiously. Her faith, prayers, fasting, vigil, studies and her charity transformed her small cell into a holy place which was literally and metaphorically sweet-scented. 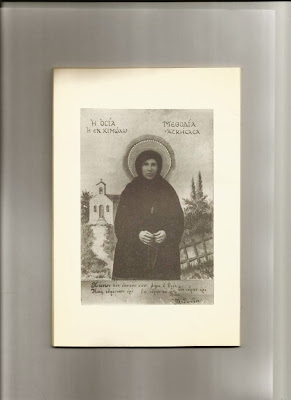 From the site of her confinement Methodia seldom left, except to participate in the Divine Liturgy and receive Holy Communion, or when there was great need and she wanted to assist someone who was in need. Her confinement was absolute during the period of Great Lent, and she accepted to listen and give advice to women who were in great need and with whom she communicated through a small window, the only one in her cell, without opening her door. However, the rest of the time her cell was a true sacred school not only for the women of Kimolos, but also for women from came from other islands having learned about the Venerable One in order to benefit spiritually from her teaching, to find relief from the sufferings of life, and to draw from her inexhaustible source of faith, courage, will, love, perseverance and heart. She had dedicated students who transferred to their families the “dew and the medicament” which sprung from the sacred site and we can argue, with no hint of exaggeration, that she influenced the life of all her compatriots. Strict fasting, vigilance, prayer, tears, study, humility and charity enabled Methodia to become a “healer through Christ”, receiving the grace to perform miracles. Miracles that are testified by her compatriots, but also miracles that took place and continue to take place even today to those who invoke her help with a pure heart and faith. At the age of 47 and after, a brief illness caused the “Christ-bearing” Venerable Methodia to pass away on 5 October 1908, while it was generally believed by her compatriots that God placed her amongst His Saints. In their mind she was a Saint and that was obvious in the fact that on 15 August 1946 they composed and signed a confession by which they recognized the Venerable One as “patron saint and guardian of the island and a great benefactor of us all”. 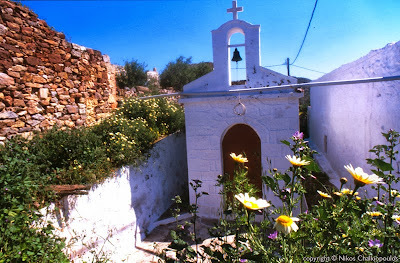 In 1962, in the place of her ruined cell, a small church was built, honored under the name of Panagia the Merciful and the Venerable Methodia. They transferred her holy relics from the Church of Saint Spyridon, where they were kept since then, and placed in a crypt within the church. On 5 October 1991, the day of the event for her official declaration as a Saint, her remains were transferred again to the Sacred Church of Panagia Odigitria and they are still kept there at the holy shrine for every faithful Christian. They called her an unsleeping vigil candle, the pride and guardian of Kimolos, inspired by God and valuable vessel of God-sent virtues, a luminescent lamp and brilliant glory of the Cyclades. Innumerable are the epithets with which the admiration of the pious Christians adorned the humble peasant girl who felt the Lord’s calling from a very early age and responded with all the might of her soul. In the last two centuries the Cyclades given four holy figures to our Church: Saint Nikodemos the Hagiorite from Naxos, Saint Arsenios from Paros, Saint Pelagia from Tinos and Saint Methodia in the 20th century from Kimolos. Her official glorification took place by the Ecumenical Patriarchate, with the Act 499, on July 17th 1991. 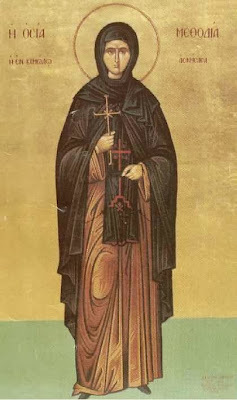 Let us faithful honor with hymns the venerable Saint Methodia, the offspring of Kimolos, the jewel of virtue, and truly the peer of the holy Ascetics from the earliest times, imitating the deeds of her life beloved by God, crying out: glory to Him Who gave thee power, glory to Him Who crowned thee, glory to Him Who hath numbered thee, O holy Mother, in the choir of the Saints.